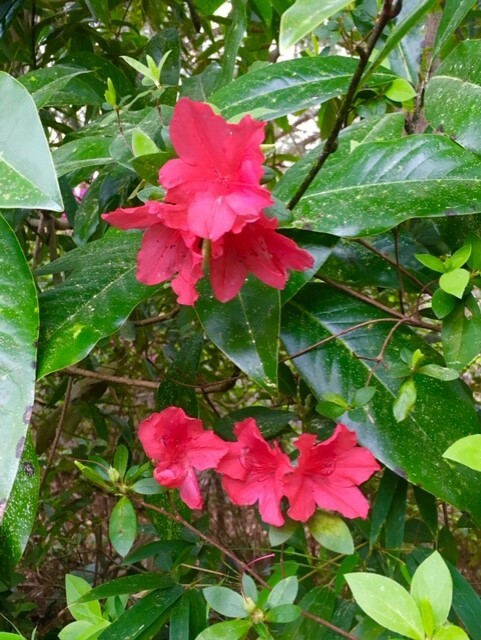 I had to go get “Pinkie” (my faithful old pink robe) from off the back of my bedroom door to write the blog yesterday…it is the first day of spring and downright cold for us low country residents. The temperatures barely made it out of the forties into the low fifties for a high…Plus the day was heavily overcast with a sky filled with deep gray clouds….chilly-willy! So for the first time in as long as I can remember…I made a fire for the first evening of the first day of spring! However the damp cold didn’t stop the flowers from blooming. 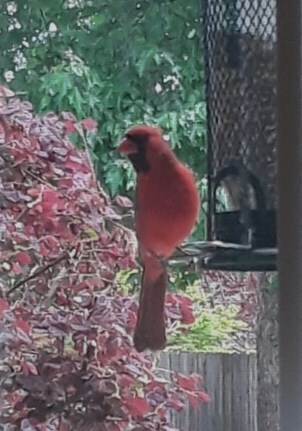 When I looked out my window by the computer and saw where a branch from an azalea bush had grown into the magnolia tree…it reminded me that no matter the weather…spring really has arrived and it is beautiful! *As you can see we still have pollen around (on the magnolia leaves) but it is getting better every day!! I like the last quote because these days I so appreciate the changing of the seasons and I, literally, pinch myself that I am still here to see another new season arrive…what a lucky gal I am! Happiness is! It is spring of 1943 during World War II. Standing among hundreds of new soldiers at Camp Grant, in Illinois, my father, Sam, just 18 years old, waits as a truck slowly drives by. A full field pack is randomly tossed to each soldier. “How strange,” my father thinks, as he sees his last name, Litrenti, marked on each item in his pack. “How did they know it was me when they tossed the pack?” He was impressed! 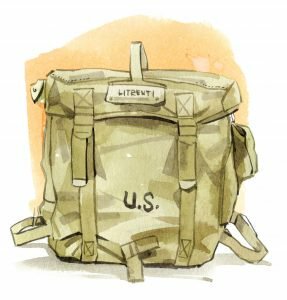 Beating all odds, my father was tossed a field pack from World War I—his own father’s. So until tomorrow…Thank you Father for the promise of spring and life renewed…with God Winks accompanying each day…if we open our eyes to Your Presence. Sammy’s cousin Butch and his wife are hanging out this spring in Kelly’s (Jo Dufford’s daughter) yard. 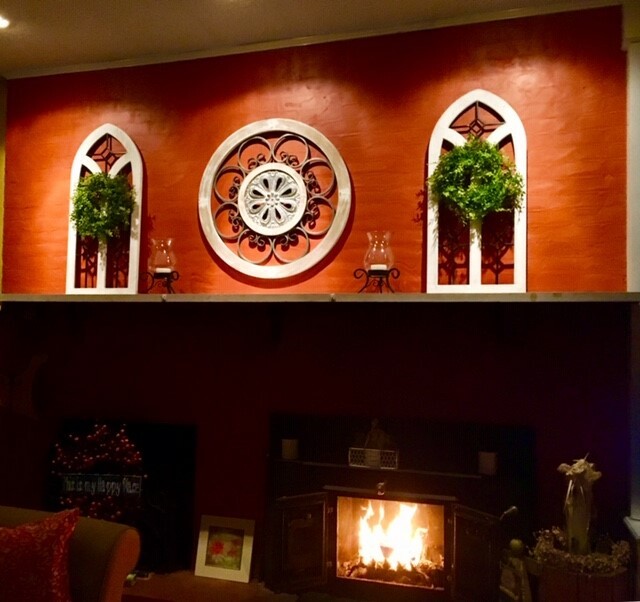 It is nice to know the family stays close… living in the same town. Hope Butch gets over for a visit soon. 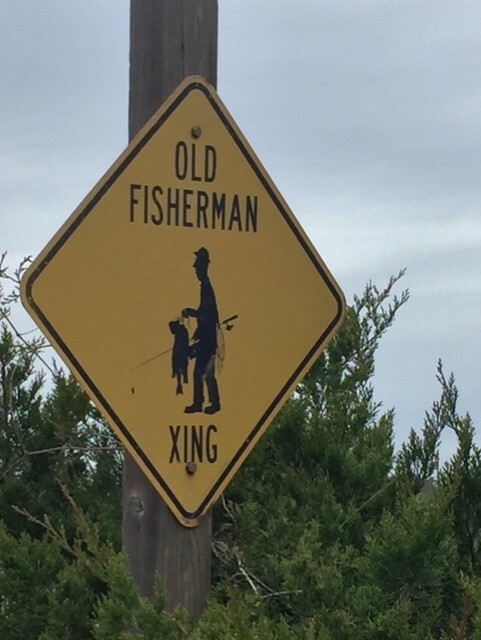 Spring time brings the fishermen out and I saw two fun things about this popular past time that made me smile…one was crossing sign for old fishermen that Brooke and I found at Pawley’s Island when we were driving around and second was a little anecdote in a recent story I read. 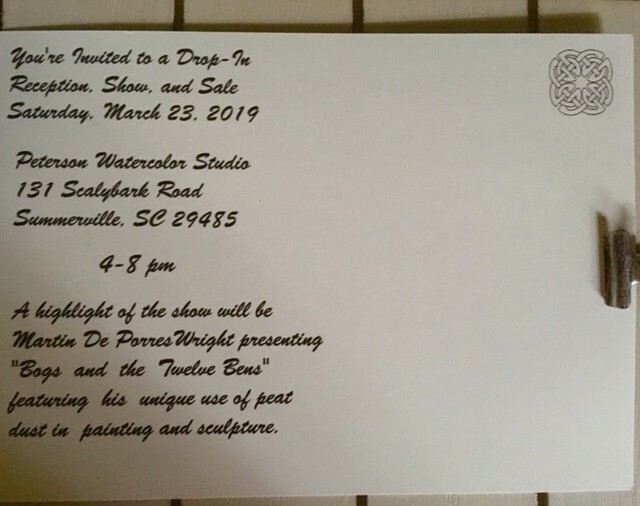 Every year one small town’s pastors of every denomination would get together for a three day fishing trip…they always left a note on their office doors letting their congregations know what they were doing and bragged that this ritual always brought more people into the church. 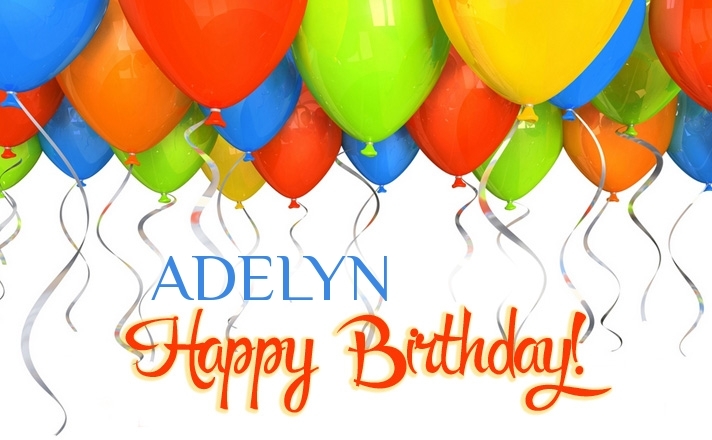 Spring brought us Ady ten years ago today…and what a gift she has been! 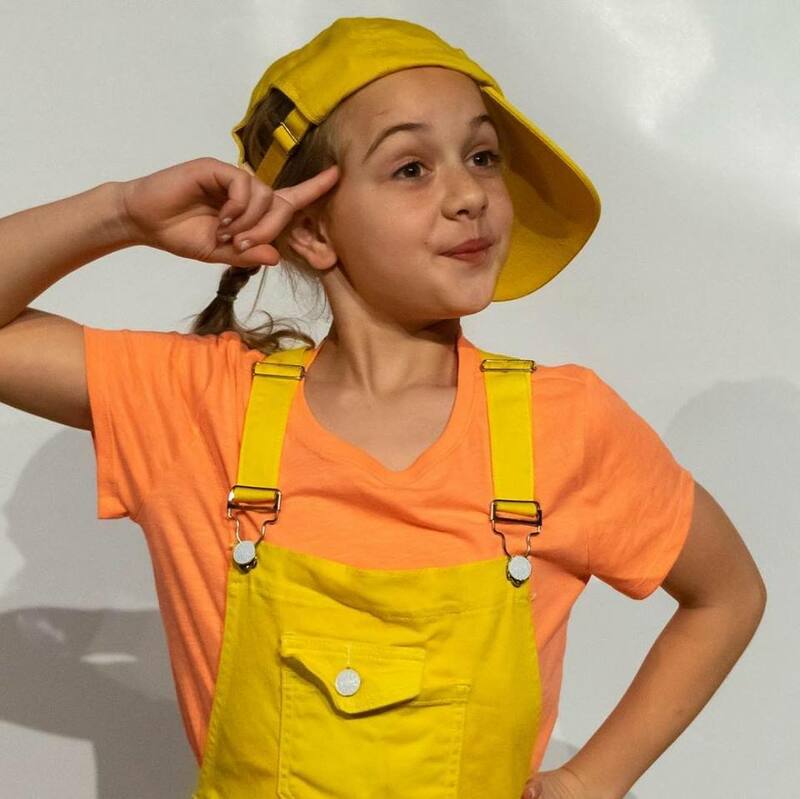 This adorable picture is a promo from her up-coming leading role as Jo Jo in the Dr. Seuss children’s musical… Her older cousins are definitely coming to see “Jo Jo” perform in April! 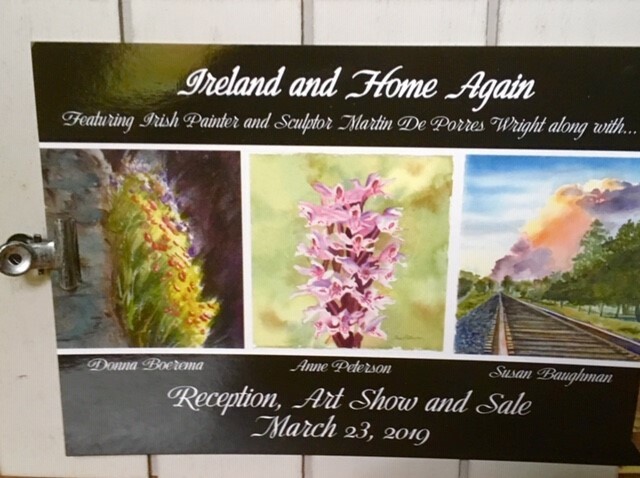 ***It’s Getting Closer….Mark Your Calendar…This Saturday from 4-8…and you can actually be late or early or somewhere in-between…Just drop in for fun, fellowship, and beauty…there will be plenty of it to take home. 4 Responses to Cloudy, Chilly…Nonetheless Spring Arrived! Yep! the ploon here is ready to fly and cover everything in the path. Jo Jo is going to be a hit. Just look at that smirk. Yep…she was definitely meant to perform for sure…has just the right personality for it.So cute! Well…lol…that is pollen just in case you are wondering.